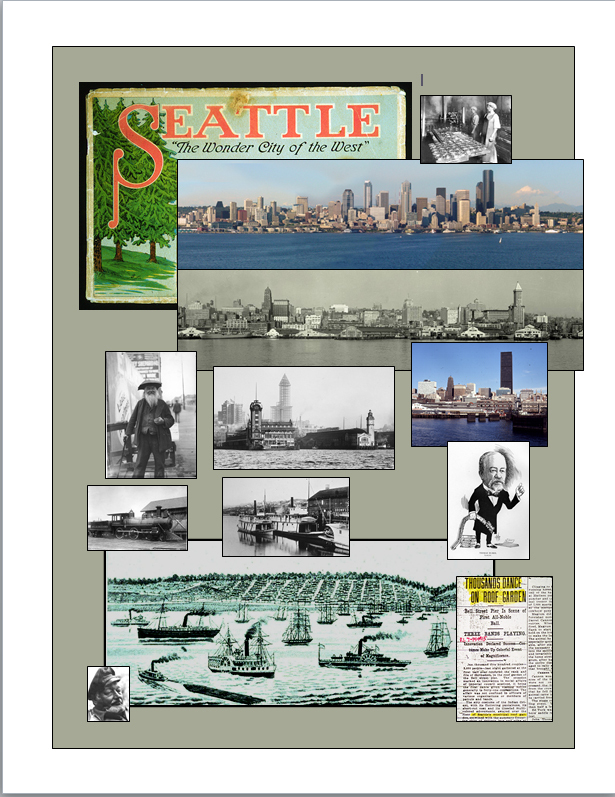 This illustrated history of Seattle’s waterfront is a collection of touchstones – a roughly chronological one. As the table of contents reveals it is bumpy and reading it is more like walking on a beach of river rocks mixed with polished pebbles than down a graded road. The writing was done over a four month sprint and modestly supported with tax dollars – your taxes if you pay them. The client was your Seattle City Council, and its agent, the then city councilman Peter Steinbrueck. Peter felt that members of the council should know more about the waterfront’s past in order to act wisely with issues of its future. In 2004 it was on the verge of the big changes that are now in 2011 beginning to unfold. Now with the help of Ron Edge’s machinations – scanning and sectioning – you too may easily read this “Edge Edition” from cover to cover. If you do I guarantee at least a feel for the history of our waterfront, but, again, a bumpy one. Or you are encouraged to enter this field of historical touchstones at any point and leave so too. Whichever, this may be satisfying. This is fantastic! I have been searching for several months for good information and photographs of the waterfront-This reference has the best photos and documentation I have seen. I am doing a school research project and this gave me the info I needed. Even better than the UW archives! Great work-where can I buy the printed version? Months later and not sure it is even you, but printed versions to the Waterfront History were produced by City Hall for the city council and a few of the local libraries. Probably your best way would be to download what I wrote and the illustrations to and take them to the U.W. bookstore for a “print-on-demand” book of this printed on their machine at the U.W. book store. They are pretty cheap too. The only payment I need is some piece of original forsaken art (no mass produced prints please) purchased at a garage sale anywhere.